So you want to have better footwork? Clear a space and get your stop watch and your dominant stance ready for ten minutes that will give you everything you need to have better footwork technique. 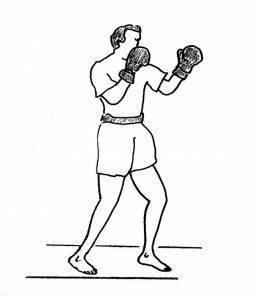 If you’re not confident about your fight stance let me give you a boxing stance to practice in. Standing with your feet shoulder width apart step your dominant leg backwards the same distance and keeping your feet shoulder width. With both toes facing forward and both knees bent keep your weight 50/50 across both legs. When we are still our heels can be on the ground but when we move we keep our heels off the ground by a couple of centimetres. Place your lead hand up in front of your nose making a fist and your dominant hand beside your chin making a fist. Keep both elbows in and your head and eyes up. This stance will be perfect to practice these movements. Let’s get into our stance and get warmed up. No matter your stance there are things that don’t change. Make sure your shoulders and hips are in line with each other. Make sure your knees are bent. Keep your arms up and your head/eyes up. A tip for every stance: Your feet and legs should push into the ground and feel strong. Avoid reaching or lifting with your legs and un-aligning your hips and shoulders. A fundamental part of every fight stance is not allowing the legs to criss-cross or come together. Now in your stance I want you to step forwards with the lead leg then follow it with the dominant leg to return to your regular stance. This is one step. Every step starts and ends in your fight stance. Do the same stepping backwards with your dominant leg stepping back first and your lead leg following. Now to step to your right, your right leg steps to the right and your left follows. To the left the left leg steps to the left and your right leg follows. The idea here is to train yourself to step with the leg that is closest to the direction we want to go and always follow it up with the other leg. It probably took you more than a minute to read this but I hope you have that sorted so we can move forwards. Let’s put some of that into place. Be ready for a two minute round of footwork. Get in your stance remembering everything from the warm up. Now take 3-4 steps forwards remembering lead leg followed by the dominant leg. Then 3-4 backwards remembering dominant leg followed by lead leg. Keep those knees bent and I meant rally bent and strong with everything in line. Head up and as fast as you can for two minutes back and forth continuous with that. Are you sure that was two minutes? For our next round we need something as a reference point. It can be a punching bag a towel or whatever you can move yourself all the way around. Before I explain this one remember we are not sidestepping here and our feet will not be coming together or sharing the same plane. Our legs will stay apart with one forwards and one back. With your reference in front of you I want you to move around it to the right letting the right leg step and the left follow. To circle you will have to step on angles so work on this. Once you have gone all the way around go to your left, again keeping your feet apart and stepping on those angles. Now for this two minute round we will be moving around our reference to the left and right changing directions when we feel. Keep those knees bent and I will see you after. For your next round we still need our reference and we still need our stance to be strong. Knees bent, hips and shoulders in line, hands/head/eyes up and feet apart. We are going to freestyle our footwork using our reference point. Practice moving in and out, practice moving to the sides and practice moving around. Take two steps in, then two to the right, then two steps back, then two steps in, two to the left and two back to your starting point. Step in and go around your reference until you are at your starting position then around the other way and step back. Now one more evasive movement that will take your footwork to the next level. Remember it like this; big step, little step. It’s predominately for creating distance between you and an opponent. In your stance you move your dominant leg back with a big step and your lead leg follows. As soon as your lead leg has moved you take a regular step in the same direction you are travelling with your dominant leg followed by lead leg. One big step, one little step and lots of distance between you and danger. You can apply this movement to your left and right movements as well. In clear space move around using the footwork techniques you have learned and apply some of these evasive moves in between. Visualise someone you need to move away from and do it. Are you sure that was a minute? Ready for the finale? Get in your stance, knees bent, hips and shoulders in line, hands/head/eyes up. Nice and strong. With your reference in place. I want you to keep a distance of one arm’s length between you and your reference minimum. Using what we have practiced for stepping in and out and to the sides move around. Try to speed up your steps and feel as light and strong on your feet as you can. Make sure you move in all directions keeping that distance and throw in some evasive steps too. With this ten minute routine and tips you should be well on your way to much stronger footwork game. Be warned we didn’t cover everything there is to know about footwork. Those will come later after you master these techniques.